A couple browses Sassafrass on Sutton. 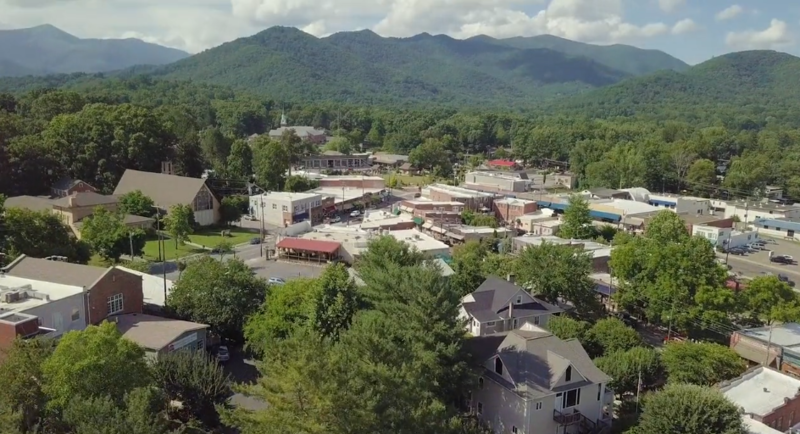 Black Mountain, America's prettiest small town (a TripAdvisor reader designation), has over 40 locally owned shops resting below the scenic Seven Sisters mountain range. Shop offerings range from local art and pottery, quilts, mountain-themed mementos, jewelry, home furnishings and much more. Asheville's flourishing food scene has also had its natural impact on Black Mountain's 30 or so restaurants, and also results in a wide range of dining options to enjoy on your Black Mountain shopping excursions. For local art, the Seven Sisters Craft Gallery is a good first stop. The gallery, which has been in existence for over 20 years, has over 350 (mostly) regional artisans work - paintings featuring mountain photography, unique pottery, sculpture and many more pieces of art, plus fine crafts and locals goods. Chifferobe Home and Garden's slogan is "eccentric objects for unconventional people," a very fitting tagline, though, they really do carry items, decorations, furnishings, and gifts for everyone. If Bon A Fide Pet Boutique isn't proof that we are a pet-friendly town, we aren't sure what is. The storefront is stocked full of pet gear, harnesses, leashes, toys, interesting gadgets and an entire display case of gourmet treats for your furry friends. For many, it's a movie-time companion, but we don't think you'll be able to regulate your popcorn consumption to movie times only once you try this stuff. Poppy's Popcorn has two locations, one in Asheville and conveniently in the heart of Black Mountain. With sweet and decadent flavors like Salted Caramel to savory tastes like Olive Oil and Rosemary or Thai Spice, Poppy's is sure to win you over pretty quickly. They also ship everywhere so you can share the popcorn goodness with friends and family or keep it all to yourself. At Greybeard, we are not ashamed to say we are a fan of a great glass of wine and good company or even just a nice mountain view. Merry Wine Market fuels this type of passion. Not only do they have an excellent selection of wine and beer for all price ranges and preferences, depending on the season, they will offer free wine tastings in the evening. Did we mention they are super helpful and know their wine? That helps. Plus, they have excellent alcohol-themed gifts like a beer tie. One insider's tip is that if you purchase 6 bottles of wine, you will receive a 10% discount on your total order. 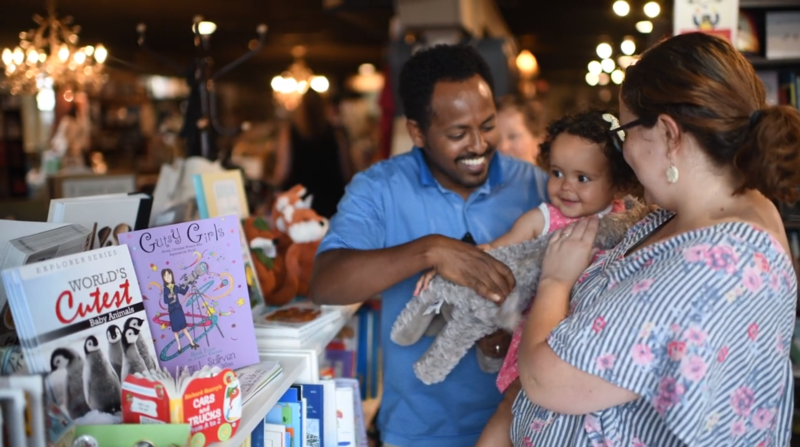 Black Mountain's newest bookstore, Sassafrass on Sutton, is tucked into the lower level of a historic Black Mountain building and is a book lovers dream. Access best selling books, get some great gift ideas and enjoy grab a warm drink from their coffee bar. The atmosphere is excellent to just sit back and enjoy a good book. Running enthusiasts can rejoice because Black Mountain has its own running store. Vertical Runner supplies some great options for running shoes, shorts, shirts and gear. You can also pick up gear such as hydration packs, disc golf discs and more. Vertical Runner also welcomes anyone to join their weekly Wednesday run at 6 p.m. The group runs 2-5 miles around Black Mountain (depending on how far you want to run), and then gathers together at Lookout Brewing. Rainbow trout, brown trout, brook trout, walleye and bass make Western North Carolina a fly fishing paradise. One Fly Outfitters is an excellent resource for all of your fly fishing questions as well as a supplier of fly fishing gear. They also offer a guide service for half day or full day fly-fishing wade trips in streams in Pisgah National Forest and Great Smoky Mountains National Park. These mountains are meant for exploring, and Take a Hike is Black Mountain's local outdoor outfitter that can get you the gear you need for any excursion. They have an excellent selection of hiking shoes, boots, clothing, plus any gadget or gear item you could need from sleeping bag to headlamp, to hammock. Some people explore by foot, and others prefer whipping through rocky single track on a bike. Epic Cycles is your go-to for all things road and mountain biking. They can rent you a bike for 24-48 hours, fix your broken bike, help you restock supplies or gear for your bike or sell you a bike! They are friendly, helpful people. This list stops at 10, but the options for great Black Mountain shops that are worth exploring doesn't stop there. Visions of Creation crafts amazing custom jewelry pieces designed by Roberto Vengoechea, and is worth a visit, there is Kilwin's Black Mountain for delicious chocolate truffles and ice cream, Black Mountain Yarn Shop which offers knitting and crochet clinics, and many more. You can view an even larger list of shopping in Black Mountain here.